You can't really live the apocalypse unless your rig looks the part. One of the things that I most admire about the Fallout fandom is how many creative and immensely talented cosplayers, artists, and modders exist within the community. Their passion for this specific fictional apocalypse is immeasurable, and I hope to one day join their ranks. But until then, I’m happy just playing the games. With the Fallout 76 beta having officially just begun and the actual release just around the corner, I wanted to share a few of my favorite Fallout case mods and rigs that I’ve come across over the years. At the top of the list comes one that we posted about a few years ago as part of Maximum PC’s “Rig of the Month” series. BSMods created this Fallout 4-themed system before the game officially launched in 2015, complete with real metal parts salvaged from scrap yards. After receiving an invite from Corsair to enter one of their contests, Bob Stewart and Rod Rosenberg modded this system around a Corsair Graphite Series 780T full-tower case—and the results make me want to take up welding. On the left side, a vault door inscribed with 111 swings open to reveal the hardware, which has been painted an extreme, rusted look. Using transparent vinyl with a quarter-inch light box, the right side looks like a legitimate TV screen, complete with the retro “Please Stand By” message. But my absolute favorite part of this rig is the “on key.” Instead of an on button, there is an actual key that you turn to power up the system. It’s such a small detail that taps into my love for both vintage and modern tech simultaneously. This next custom rig is a recent one, posted earlier this month by Desireecosplay on Imgur. Using a Fractal Design FD-CA-BU-W Focus case, Desiree gave it a custom paint job using stencils, complete with the Vault Tech logo on the front and blue and yellow theme colors. The accent rust patches, yellow lighting, and Pip Boy mascot inside the case pull the entire look together in a simple and subtle way, a great example of how creative you can get with a $70 case and a little bit of acrylic spray paint. This one I came across on a seemingly abandoned blog from a 2013 post. Couldn’t find much information about the originator of this case mod (the perils of going down the Pinterest rabbit hole), except that it was part of the Geeked-out Ripten Showcase. This case is a compact version of the furniture-sized TVs of the 1950s and 1960s, like Philco Television or RCA Victor. While the rounded side panels give the case a less boxy look than turn of the century televisions, the entire unit is encased with wood paneling. The cross-stitching below the screen, where the nobs would normally go, completes the retro aesthetic. It makes me miss my grandma’s old TV that lasted for over 50 years before it finally broke. Dewayne “Americanfreak” Carel debuted his first Fallout modded case on Modders Inc. back in 2014. Using a Thermaltake s41 Urban case and inspiration from some of the control stations in Fallout 3, he definitely went all-out in capturing the post-apocalyptic, 1950s vibe. He also thoroughly documented his step-by-step modding process, from using paper to creating a template of the terminal frame design and scouring eBay for analog gauges, to creating a rusting effect with paint and hairspray. This isn’t just modding, it’s artistry. Dewayne’s work was so popular that it was a featured as a giveaway during Nvidia’s Fallout 4 Radiation Check Contest in 2015, and they asked him to create another one for Fallout 4. Dewayne’s second Fallout case focused on a more or less pristine Fallout look. Based on the decontamination pods, one side of the case features a sterile, medical vibe and intimidating red letters that say ‘stand clear.’ The other side has a vault 111 door in the shape of a giant cog, colored in dull yellows and browns. He once again shared his design process on Modders Inc., mostly consisting of images of it near completion, but in an interview with Nvidia he delved into specifics, such as purposefully designing the case with less accessories so it would be able to be shipped long distances without getting damaged. With Fallout 76’s release date right around the corner, maybe he’ll make another one? This sleek, bright mod comes straight from the Corsair user forums. A modder by the name Alex built this gorgeous, liquid-cooled system, affectionately calling it the Vault Boy, in 2015 using a Bitfenix Prodigy case and White DarkSide Connect LED strips from DazMode. He also individually sleeved each cable in blue and yellow to match the entire color scheme and used clear acrylic panels all the way around so every piece of this rig can be thoroughly enjoyed. He even slapped the Pip Boy mascot on the reservoir for good measure, making this custom rig one of the most fictional brand-aware of them all. My last and final pick comes from YouTuber The Post Apocalyptic Inventor, who combined a 2013 computer and a 1973 CRT TV to make this crazy, truly custom Fallout case. If you are the kind of person who loves to take apart old machines and put them back together, then this is the build for you. While he does mention a few things about repairing and rewiring the older parts, the exact how-tos are not a focus in this video, but rather on the build itself. He takes an “average, boring, soulless, run-of-the-mill cheapo” case, cannibalizes its parts, completely guts the CRT TV, and Dr. Frankenstein’s his way into some retro-modern goodness. It definitely one of the more creative Fallout builds I’ve seen in recent times. 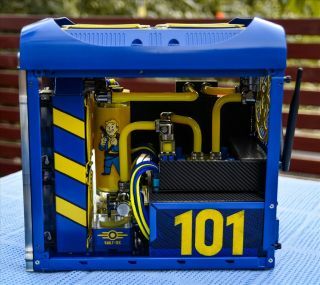 Have your own favorite Fallout case mod you’d like to share, or maybe one that you’ve built yourself? Lets us know in the comments!